Thought I'd give a little update on what I've been up to of late. I've actually been really busy. Since joining Tronix / HTO almost a month today I've already done three magazine features on the Perch side. One on ultralight jigging for a tackle pull-out, one on Dropshot for the Angling Times and another for AT that's yet to be published - again on the lighter side of luring. It's been interesting as I've had to very quickly adapt my tackle choices, trying to replicate the winning formula with a new range of gear. I'm extremely pleased to report that it's been going really well actually. I made a call that I would start logging all my freshwater captures again - as much to aid me make the right tackle choices quicker. So after laboriously loading the entire HTO lure range into my app, I was out fishing. And so far so good. At the time of writing I've logged 136 captures, without really having had the chance for a proper session yet. They include Perch, Jacks and four Ruffe. Those of you that know me well will understand how important those Ruffe are, as it demonstrates that I've been able to replicate the balanced approach I've become known for. There is some very real anxiety in letting go of the familiar. I'm over the moon to be honest! I should highlight that I've concentrated on HTO for now. Being the homegrown lure brand under Tronix it offers the angler the best value. I really want to show that this ultra-light, ultra-fun side of modern lure fishing is obtainable by everyone - not just those with deep pockets. As desperate as I am to get my hands on the likes of AquaWave and Westin, that's my personal agenda for now. My bread-and-butter, ultralight Jighead approach has translated directly across. The HTO Maikuro Jig Heads in size 10 have become my new best friends. Having crushed the barbs I already feel confident with my hookup rate. With a barrage of magazine features almost instantaneously upon me, I was quickly drawn toward the 'Tiny Fish' lures. I've been cutting them back slightly (as I did with my previous favourites) and they've been working well. The lack of frosts this autumn has slowed down the improvement in clarity in my local stretch of the K&A so I've been limited to use of the brightest Pearl White colour, but it should only be another week or two before I can start fishing the more natural colours. I can't wait! With the comp season behind me for now, I've enjoyed using some slightly bigger lures - even over 50mm! 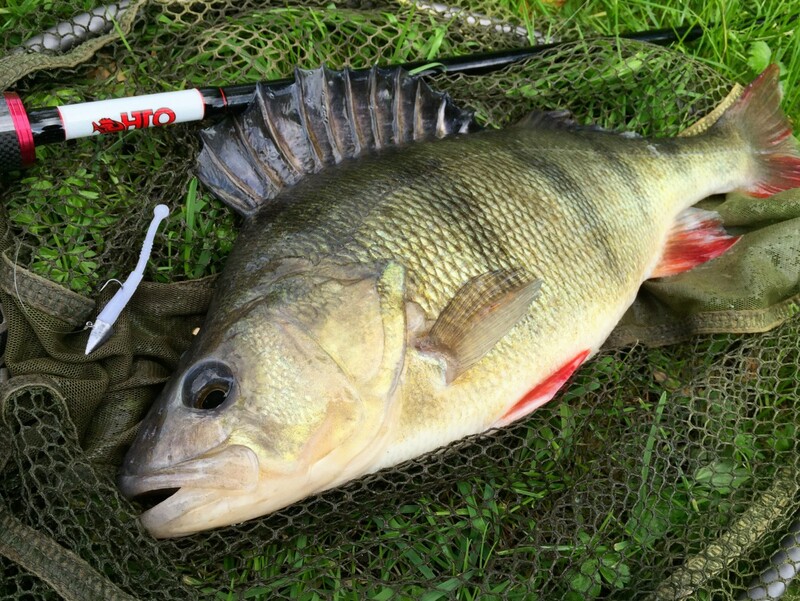 :0) In fact my biggest Perch so far this autumn, a nice 36cm fish of 2lb 4oz, came on the in-house designed HTO Flail. A classic bobble-tail design. No rocket science. It just works. I've barely scratched the surface of the range, but why rush into it. I'm going to enjoy the discoveries. Lastly, I've volunteered myself into rehab over my growing addiction to expensive Japanese carbon. So my Methadone of choice is the £38 Rockfish T. The 'T' (tubular) is a relatively recent addition to the range and has allowed me to replicate some of the F1 performance of my Japanese stick. I still get the same buzz from feeling a Perch hit the lure on-the-drop, even with a slack line. And the reel-seat is bang-on, allowing me to get my entire index finger on the blank. Obviously it doesn't offer the extreme performance of a rod worth nearly 10 times as much, but in terms of enjoying my fishing, it's a little beaut. It's quite cool to have the perspective. For instance I have noticed with this rod that I do notice the extra weight of the rod after about 3 hours fishing. It doesn't stop me fishing, but I notice it. It's not as comfortable. You kind of forget about these things when you fish hyper-rods. As I say. Nice to get the perspective. Did I say? It's 38 quid! Anyway, didn't want this to become a sales pitch. I'm genuinely enjoying using gear that I might not have ordinarily chosen and importantly, making it perform.